Twilight quotes feature notable passages from the teen fiction series that moved books and put seats in theaters. The four-book series author, Stephenie Meyer, knew her teen girls audience very well. The books’ protagonist, 17-year-old Bella Swan moves from Phoenix to Forks, Washington. She catches the eye of many of the local boys and is immediately popular. Soon, she falls in love with Edward Cullen, who you probably know by now is a vampire – as is his whole family. Well, you can read the books or watch the movies to get the full story, but as you’ll tell from the quotations below, it’s a love story. Read on for some of the best quotations from the books. Twilight again. Another ending. 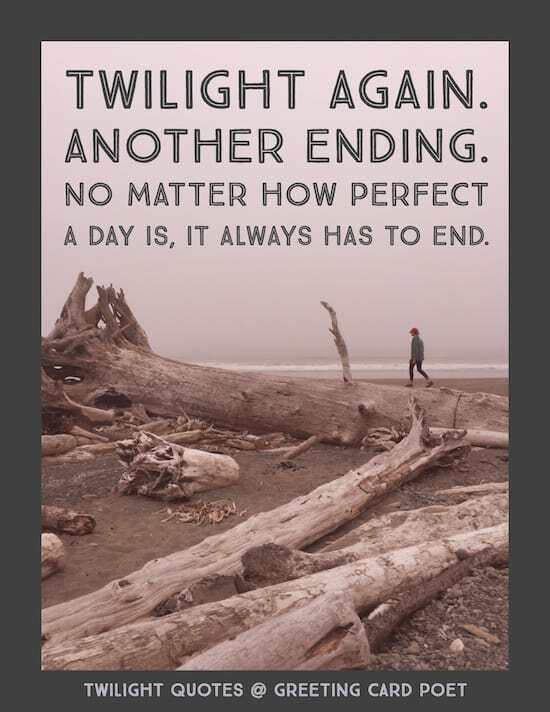 No matter how perfect a day is, it always has to end. He looks at you like… like you’re something to eat. Out of all the things about me that could frighten you, you worry about my driving. When he touched me, it stung my hand as if an electric current had passed through us. Even more, I had never meant to love him. One thing I truly knew – knew it in the pit of my stomach, in the center of my bones, knew it from the crown of my head to the soles of my feet, knew it deep in my empty chest – was how love gave someone the power to break you. How old are you? Seventeen, he answered promptly. And how long have you been seventeen? About three things I was absolutely positive. First, Edward was a vampire. Second, there was part of him-and I didn’t know how potent that part might be that thirsted for my blood. and third, I was unconditionally and irrevocably in love with him. It is extraordinary thing to meet someone who you can bare your soul to and accept you for what you are. Edward in the sunlight was shocking. I couldn’t get used to it, though I’d been staring at him all afternoon. I couldn’t bring myself to regret the decision. When life offers you a dream so far beyond any of your expectations, it’s not reasonable to grieve when it comes to an end. Common sense told me I should be terrified. Instead, I was relieved to finally understand. And I was filled with compassion for his suffering, even now, as he confessed his craving to take my life. What if I’m not a superhero. What if I’m the bad guy. It’s twilight. It’s the safest time of day for us. The easiest time. But also the saddest, in a way…the end of another day, the return of the night. 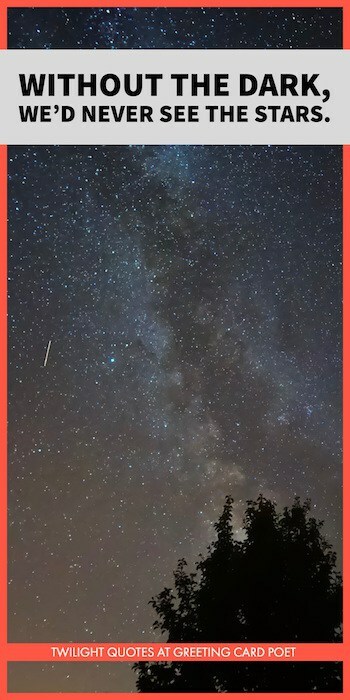 Darkness is so predictable, don’t you think? Love and lust don’t always keep the same company. I can feel what you’re feeling now — and you are worth it. You’re intoxicated by my very presence. Just because I’m resisting the wine doesn’t mean I can’t appreciate the bouquet. And so the lion fell in love with the lamb…” he murmured. I looked away, hiding my eyes as I thrilled to the word. “What a stupid lamb,” I sighed. “Bella?” a different voice called from the distance. My mind. I knew exactly what caused the difference, and it disturbed me. It was amazing how instantaneously the choking fear vanished, amazing how suddenly the feeling of security washed over me – even before I was off the street – as soon as I heard his voice. It was a strange combination to absorb – the everyday concerns of the town doctor stuck in the middle of a discussion of his early days in seventeenth-century London. Making decisions was the painful part for me, the part I agonized over. But once the decision was made, I simply followed through—usually with relief that the choice was made. 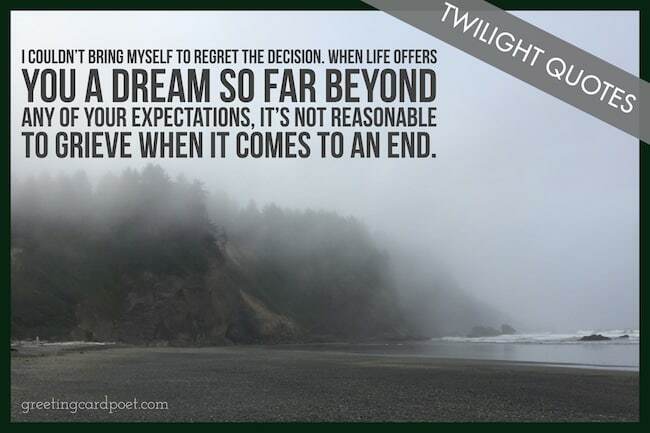 Sometimes the relief was tainted by despair, like my decision to come to Forks. But it was still better than wrestling with the alternatives. For some reason, my temper was hardwired to my tear ducts. I usually cried when I was angry, a humiliating tendency. I don’t like to lie – so there’d better be a good reason why I’m doing it. He wished he hadn’t pulled me from the path of Tyler’s van – there was no other conclusion I could come to. Your Help Needed: Do you have any suggestions for Twilight Quotes? Let us know on the Contact page. Carlisle has a theory…he believes that we all bring something of our strongest human traits with us into the next life, where they are intensified – like our minds, and our senses. No one could be still like Edward. I’d noticed that his eyes were black – coal black. My mom always says I was born thirty-five years old and that I get more middle-aged every year. 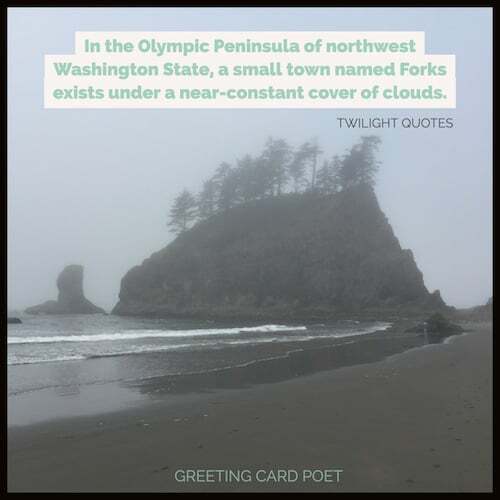 In the Olympic Peninsula of northwest Washington State, a small town named Forks exists under a near-constant cover of clouds. And then as you were sleeping, you said my name. You spoke so clearly, at first I thought you’d woken. But you rolled over restlessly and mumbled my name once more, and sighed. The feeling that coursed through me then was unnerving, staggering. And I knew I couldn’t ignore you any longer. Of course, then you nearly crushed to death in front of my eyes. Later I thought of a perfectly good excuse for why I acted at that moment – because if I hadn’t saved you, if your blood had been spilled there in front of me, I don’t think I could have stopped myself from exposing us for what we are. But I only thought of that excuse later. At the time, all I could think was, ‘Not her. I’ve never given much thought to how I would die. But dying in the place of someone I love seems like a good way to go. I can’t bring myself to regret the decisions that’ brought me face to face with death. They also brought me to Edward. Hah! You’re as white as a ghost — no, you’re as white as me! Hello I’m Edward and you are? Bella sorry I didn’t get a chance to introduce myself last week. I’d never given much too thought to how I would die- though I’d had reason enough in the last few months- but even if I had, I would not have imagined it like this. I hate you for making me want you so much. If I were lucky enough to sit by you, I would have talked to you. If leaving is the right thing to do, then I’ll hurt myself to keep from hurting you, to keep you safe. That’s the beautiful thing about being human,” he told me. “Things change. “I hear voices in my mind and you’re worried that you’re the freak,” he laughed. I can’t be sure, of course, but I’d compare it to living on tofu and soy milk; we call ourselves vegetarians, our little inside joke. You are my life now, he answered simply.